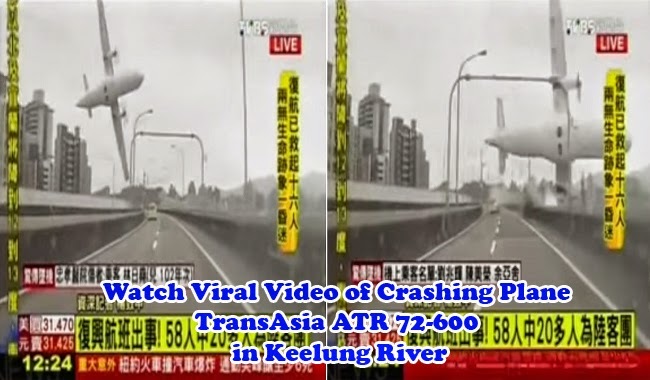 TransAsia ATR 72-600 had been caught on camera as it descended sideways crashing the side of a bridge and ultimately sinking in the Keelung river at around 11:00am after it had took off in Taipei's Songshan airport on the way to the Island of Kinsmen on February 4, 2015. There were reportedly 58 people on board TransAsia ATR 72-600 which passed through buildings in the city, before breaking the side of the bridge where a taxi driver was able to catch the whole scene as it plunge into the river. With the use of a dashboard camera, it was clear that the aircraft landed sideways. Twenty-three people were reported to have died in the accident. According to Taiwanese Central Disaster Response Centre, around 170 rescuers had been dispatched as soon as the incident had been known. Fire engines, ambulance and water crafts had also been brought in quickly. As revealed in air traffic control recording, the last call from the pilot was a call for help ‘Mayday’ and a revelation that there was an engine flameout. The flameout of an engine may happen if fuel supply had been interrupted or if there had been faulty combustion leading to engine failure. As reported by Taiwan’s Civil Aviation Authority, the weather on February 4 was fair and in good condition. The pilot had 14,000 hours of experience in flying while his co-pilot had 4,000 hours. With 58 on board the aircraft, there were 31Chinese tourist under two local travel agencies. Chen Xinde, the chief executive of TransAsia, had publicly apologized for the crash while assuring that investigation for the cause of the incident will be one of the priority. Aside from the people on board the plane, another casualty had been reported. The driver of the taxi which had been hit by the plane sustained a head injury but now was reported to be in stable condition.